Deep in the heart of California’s oldest state park lie a trio of waterfalls crashing into grottos shaded by towering redwood trees. 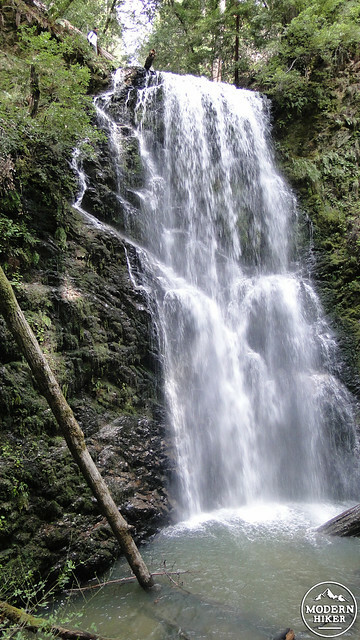 The popular Berry Creek Falls loop visits these waterfalls via a moderately difficult loop passing through pristine, old-growth redwoods nestled into the large basin that lends this park its name. 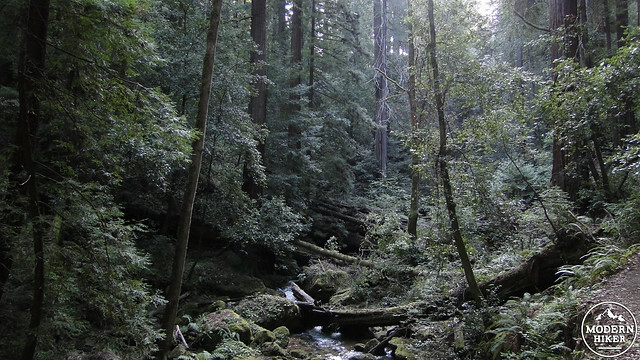 Big Basin lies in the western half of the Santa Cruz Mountains north of the city of Santa Cruz. 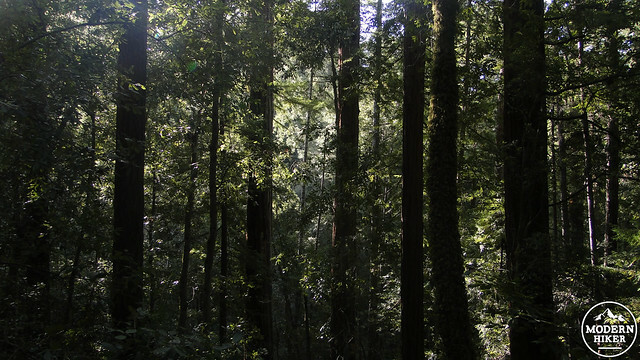 The range lies near the southernmost edge of the coast redwood’s distribution, and the range’s location, elevation, and proximity to the ocean are responsible for creating a climate that supports an impressive forest. The area’s relative elevation ensures enhanced rainfall rates, which typically reach 50″ per year during an average season. 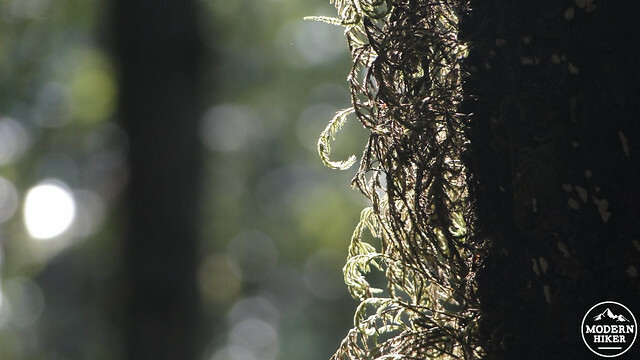 Meanwhile, the ocean’s tendency to produce summer fogs provides a sort of drip-irrigation system for the thirsty redwoods and their lush understory. 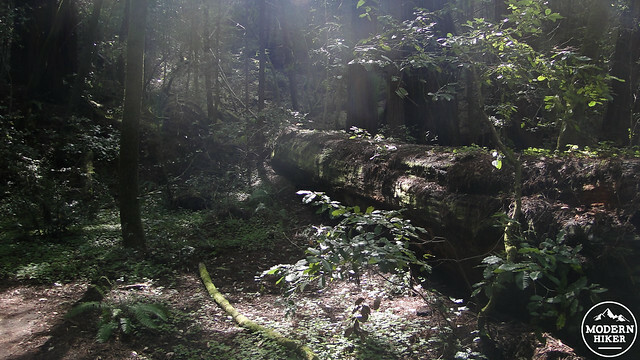 The result is a redwood forest that, despite any particularly outstanding trees, tends to hold its own against the larger and wetter forests of California’s northern coast. All of this precipitation creates an abundance of running water throughout the season. Berry Creek runs year-round, although its flow is at its most impressive during the heart of the winter season (January through March). Springtime produces a more moderate flow, but also offers flower blooms, including various lilies and gorgeous carpets of baby blue eyes. Summers can be cool and foggy, but along with that also comes the crowds of the summer season. Fall tends to be cool and dry. Backpacking is also possible on this route. 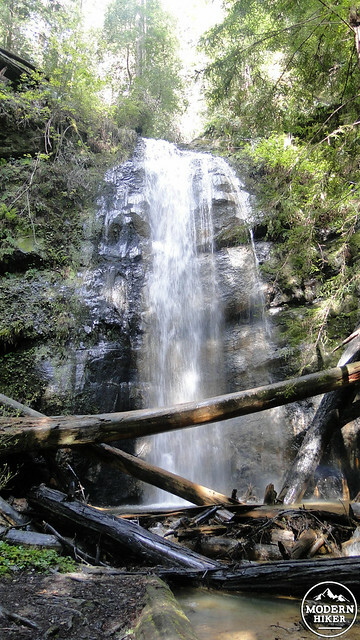 Big Basin contains five separate backcountry campgrounds within its boundaries, and Sunset Campground adjacent to Berry Creek just north of the junction with the Berry Creek Falls Trail is an ideal campground to fully explore the three waterfalls at the heart of this loop. You can reserve campsites in advance by calling (831) 338-8861 Monday through Friday between 9am and 5pm. Reservations can be made up to two months in advance, and if you plan on camping over the weekend, you’ll want to reserve as early as possible as the campground fills up fast. Additionally, the campground here is open seasonally between November 1st and April 30th. From Park Headquarters, head north along Opal Creek for .3 mile to a junction with the Dool Trail. 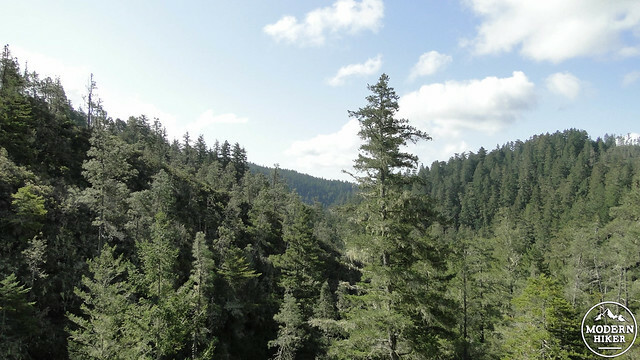 After a brief stretch on the Dool Trail, make the next left on the Sunset Trail, which will commence a 400′ climb through redwood and Douglas fir forest toward Middle Ridge, which divides the park geographically. Cross the dirt road to remain on the Sunset Trail to commence a moderate descent into the Waddell Creek drainage basin. Throughout the descent, you’ll pass through groves of old-growth redwoods with a few passages through tanoak to break up any potential monotony. 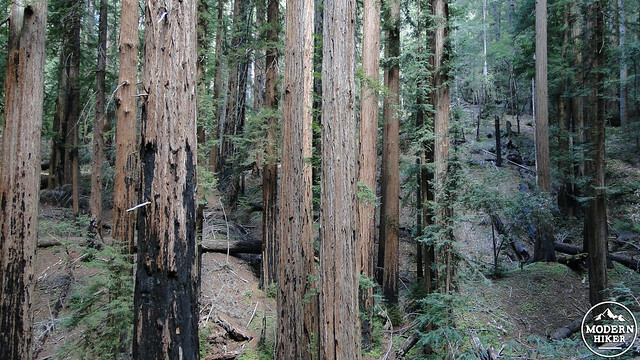 A 2008 controlled burn incinerated some of the understory, creating a more open feeling in the forest that’s somewhat reminiscent of the more open groves of sequoias in the western Sierra Nevada. In this stretch of forest, you may gain an appreciation of how the coast redwood and giant sequoia (genetic first cousins) share a number of commonalities. At 2.1 mile, the trail begins a brief ascent up and over a ridge to drop down toward Timms Creek. After passing the junction with the Timms Creek trail, the Sunset Trail commences the toughest stretch of the hike as it climbs 500 feet to the top of the ridge dividing the Timms Creek drainage from the Berry Creek drainage. Once on the other side of the ridge, you’ll enter a new ecosystem that provides a welcome shot of open space after the dense shadows of the redwood forest. For a brief stretch, the trail passes through __ rock understory that supports thickets of manzanita and copses of knobcone pine. Mosses drape from seemingly every branch, while you’ll enjoy the only open views on the route down Waddell Creek’s canyon. From here, you descend toward Berry Creek and the junction with the Berry Creek Falls Trail. 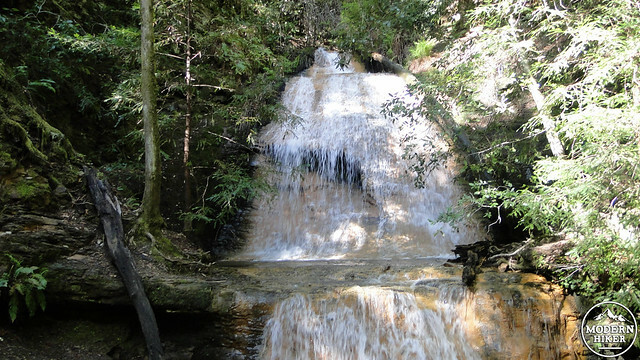 After passing a tributary to Berry Creek and crossing over a low ridge, you’ll reach a junction with the Berry Creek Falls Trail and your reward for the ups-and-downs you encountered along the Sunset Trail. It’s a straight descent through what is certainly the most magical stretch of forest along the route. Meanwhile, the hearty rumble of Berry Creek passes through a lush understory of ferns and sorrel spaced between the first two of the three waterfalls on the route. You’ll encounter Golden Cascade right away. 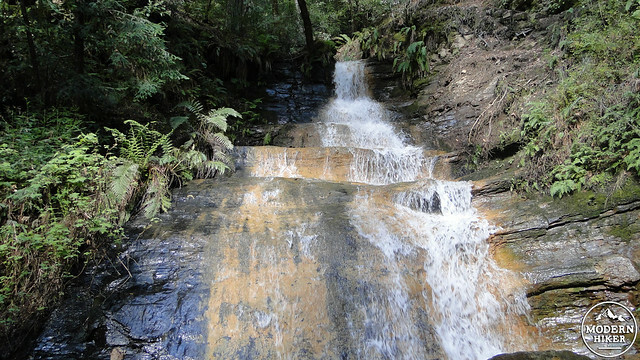 Here, Berry Creek tumbles over a series of steps hewn into golden rock. 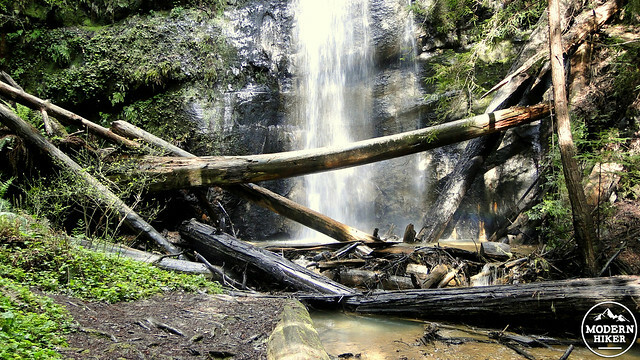 A mere .2 mile beyond Golden Cascade, you’ll encounter Silver Falls, which is a more impressive and more traditional falls tumbling into a cool grotto criss-crossed by redwood logs. Beyond both falls, you’ll continue to descend a miraculous .8 mile along the creek toward the central attraction of the loop, Berry Creek Falls. You’ll come upon Berry Creek Falls from above. It lies to your left and looks a little less impressive from this vantage point than it will in a few moments. Commence the quick descent down into its grotto to admire it from below, or you can continue on toward the junction with the Skyline-to-Sea Trail. 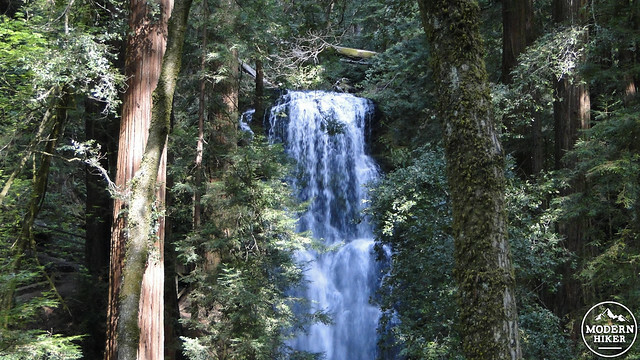 From there, you can admire the full expanse of the waterfall through towering redwoods. Regardless of the vantage you choose, you will certainly wish to spend some time exploring the heart of the loop. Crowds may be present here during the summer season, but you can achieve solitude if you’re willing to start early, hike during the week, or visit during the off season. Once on the Skyline-to-Sea Trail, turn to the east and commence a gradual climb along Kelly Creek back toward Middle Ridge. 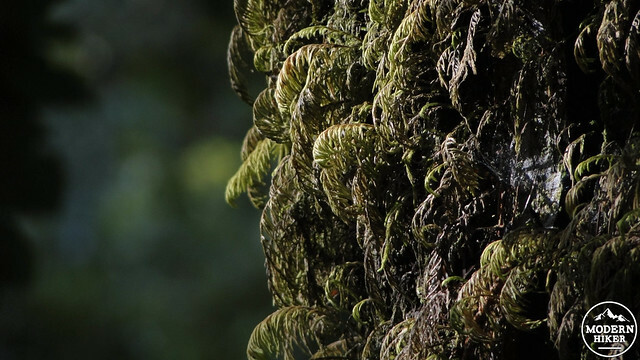 Kelly Creek is a less boisterous watercourse than Berry Creek, but there will still be numerous sublime scenes on a smaller scale where water cascades over rocks or mosses overtake the massive form of a downed redwood. Once atop Middle Ridge again, cross the fire road, you’ll commence a mile-long descent back toward the visitor center. If you have the energy and inclination left after the long hike, you can turn right onto the Redwood Loop just south of the park headquarters. 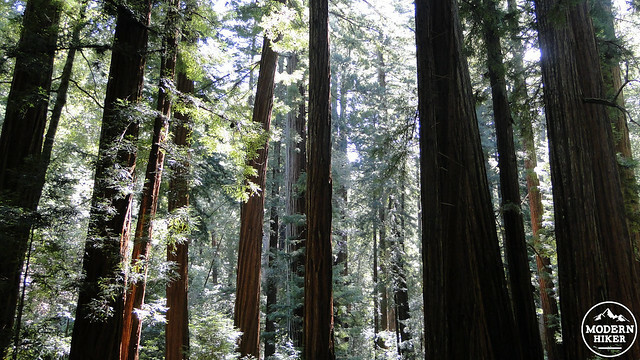 This .6 mile loop visits some of the largest trees in the park, with a few topping out over 300′. Just beyond the junction to the Redwood Loop lies park headquarters and the end of the hike. The trail is well-traveled and easy to follow. Downed trees are a potential problem, as is high water or slick trail conditions during or immediately after storms. There are a number of traditional campgrounds adjacent to the start of the hike, with Bloom Creek and Sempervirens Campgrounds being the most convenient. 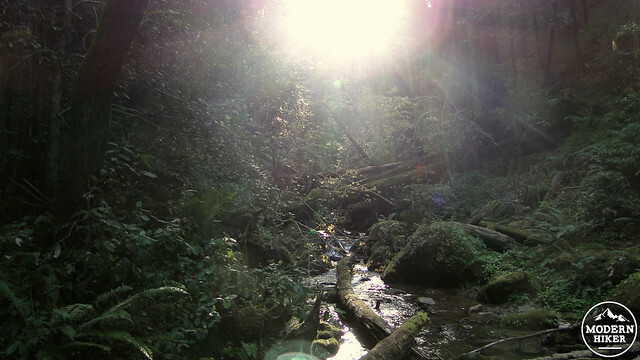 Backpacking is also an option along the route, with Sunset Campground near the junction with the Berry Creek Falls Trail being the best option. The write-up contains information on how to reserve a site at Sunset Campground. From Santa Cruz, follow Highway 9 north toward Boulder Creek. 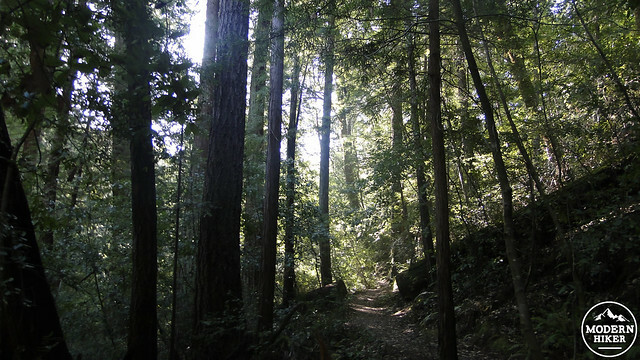 Turn left onto Highway 236 toward Big Basin State Park and continue 9.2 miles to Escape Road. Turn left onto Escape Road and follow it .3 mile to a parking area. From San Francisco, follow Interstate 280 south toward Woodside. Turn left onto Highway 35 (Skyline Blvd) and head south for 13.5 miles toward Highway 9. Highway 9 eventually becomes Highway 236, and after another 14.3 miles, you'll reach the park headquarters. Very cool. I felt like I was with you every step, trekking through the canyons and creeks. Beautiful images too Scott! 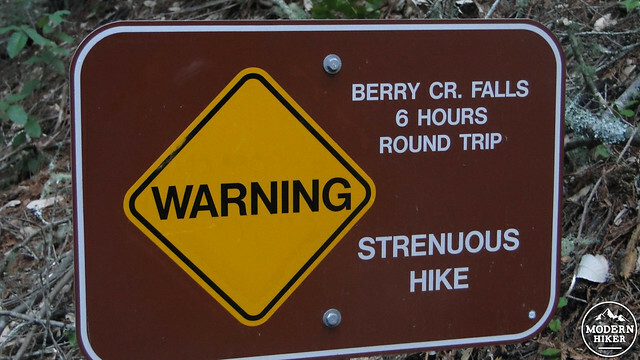 Berry Creek is officially on my list of future hikes!